The Donnas were an American punk rock band from Palo Alto, California that began making music in the early 1990’s. The group consisted of Brett Anderson (lead vocals), Allison Robertson (guitar, backing vocals), Maya Ford (bass guitar, backing vocals) and Torry Castellano (drums, percussion, backing vocals). 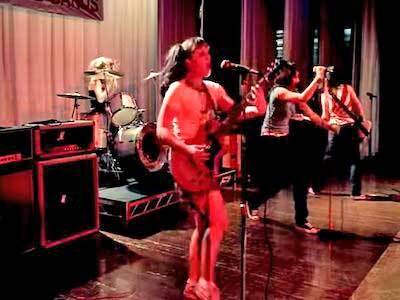 An all female group, the band gained a rabid following in the male dominated punk scene of the late 1990’s, and eventually broke out in the early 2000’s. The band was known for their blend of punk, and classic rock sounds, and for hits such as “Who Invited You” and “Fall Behind Me”. The song “Take It Off” was their biggest hit, propelling the band into the mainstream, and was even used in a Budweiser commercial. 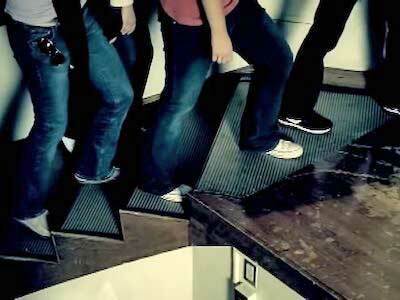 The whole band wears chucks in this video. The song starts out with a hard drop of sound, and it never lets up from there. With lyrics about how badly Brett wants a guy, the theme of this track is control. The vocals are powerful and fit in perfectly with the driving guitar and drum. The music and vocals will will harken listeners back to the sounds of artists like The Ramones and Joan Jett. Powerful vocals and a unique sound really helped The Donnas standout amongst the crowd, and highlight why this group holds a special place in the hearts of many. Even the male version of the group wears chucks. The music video begins with a shot of a door leading into a high school auditorium where a good old fashioned Battle of the Bands is being held. The Donnas are performing onstage in front of the judges and a small audience. With this being a punk video, it’s not surprising that the whole band is actually wearing chucks in this video. Lead singer Brett Anderson and drummer Torry Castellano both wear black chucks, while guitarist Allison Robertson and bassist Maya Ford wear pairs of white chucks. The band’s look fits perfectly into the rebellious pop punk scene of the early 2000’s. The band sing their hearts out but are pushed to the side by an all male version of them (the actual Donnas wearing fake goatees and hats). However, this group of Donnies doesn’t do nearly as well, and is booed off stage, bringing the original Donnas back to close out the show with perfect 10’s from the judges. It’s a fun video that fits in perfectly with the band’s standout image, and the pop punk style of videos that dominated the early 2000’s MTV schedule. Drummer Torry Castellano rocks out in black chucks. Use the links below to get new pairs of chucks for your band to wear.